It is the second weekend in August again and that means no Sales TAXES in Massachusetts!! Yay!! So – I have opened an order with a Hostess code of ES9TE9Q2 for the weekend. So this is a great time to stock up on those items that you would like, TAX FREE! …. and one of you will be the lucky Mystery Hostess and receive the Hostess benefits for the weekend! I have one order already! It could be you! So how do you use the hostess code? Go to my online store and order your items. At the bottom left of the order screen, you will see a place to enter the hostess code ES9TE9Q2. The order will say Mystery Hostess as I will be drawing a name on Sunday for one of you to select the hostess benefits!! So I may be calling you on Sunday evening! And no – I didn’t use any ribbon on these cards. I have to admit that I am really liking the Washi tape now that I have used it a few times! I can see why it is becoming a paper crafting staple! I previewed these cards last night with a few friends on the Cape. They were a big hit!! 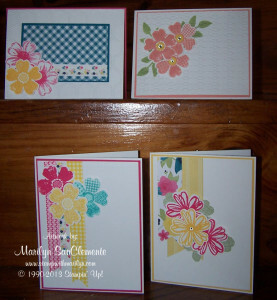 Card kit, card making, cards, Flower shop stamp set, handmade cards, MA tax FREE weekend, Stampin' Up!. Bookmark.